It is possible to make a vegan birthday cake – and really that isn’t as bad as it sounds. Today is my older daughter’s birthday. It always manages to fall during Great Lent and I am always presented with the challenge of making a celebratory dinner for her while following the fasting rules. This isn’t a particularly huge problem as my daughter is a big fan of Asian food and requests either stir-fry or sushi for her birthday dinner. There is, however, the question of the cake. When my daughter was very small, I took great pride in making her birthday cake. I even went through a phase of making them into whatever shape she requested. 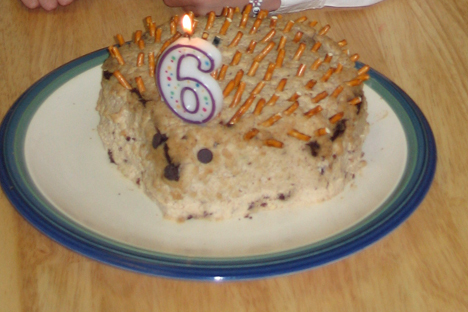 The first year I observed the fast, she wanted a cake that looked like a hedgehog. And it had to be vegan. Believe it or not, it actually isn’t that hard to make a vegan cake. Most vegan cake recipes tend to be chocolate. I’m not sure why, except that maybe chocolate is a fairly strong flavor and can hold its own against the other things you have to throw into the cake – usually some kind of vinegar to provide the reaction that usually comes with eggs. The first year I observed the fast, we had moved to a new city and didn’t know many people. We were, however, close to our neighbors and I invited them over for my daughter’s birthday dinner. After a meal of salad and broccoli stir-fry with peanut sauce, it was time for the cake. It was mostly presentable. It was kind of brown, like a hedgehog, it was the right shape and I had put pretzel sticks all over it to mimic the spikes. So maybe it looked more like a porcupine, but same general idea. The icing wasn’t particularly moist, but overall I was pleased with the effect. Until I began to hand out servings of it. 1 ¼ cup all-purpose flour; 1 cup sugar; ⅓ cup cocoa powder; 1 teaspoon baking soda; ½ teaspoon salt; 1 cup warm water; 1 teaspoon vanilla extract; ⅓ cup vegetable oil; 1 teaspoon distilled vinegar; Preheat oven to 350 degrees F or175 degrees C.
Combine sugar, flour, cocoa powder, baking soda and salt in a large bowl. Add water, vanilla, oil and vinegar and mix well. Pour into pan (s) and bake for approximately 30 minutes. Cool completely on a wire rack. Will make 1 9x13 pan or 2 8in round pans. Cake will not rise significantly. Mix well using a hand blender. Spread over cooled cake. This blog covers the challenges of following the strict fasting rule of Great Lent, including fast-appropriate recipes and notes about the religious traditions behind the season.